For gourmets a confidential tip! The mild Sarntaler handle has a ripening period of three months and is produced in the in-house buchtery by well-chosen leg shares. The fine spice and the unique aroma connects him with the Sarntal. The Sarntaler handle is as an hors-d'oeuvre, well cut, with rocket, or also with lemon and in discs of grated Parmesan a speciality. A specific feature is the "Sarntaler of pizza" with bacon, handle and farm sausages. Silver with the international professional competition in Wels / Austria. Buy now this product together with Thin Bacon Speck Sarntal L. Moser approx. 500 gr. ready for shipment: in ca. 5 days Thin Bacon Speck Sarntal L. Moser approx. 500 gr. 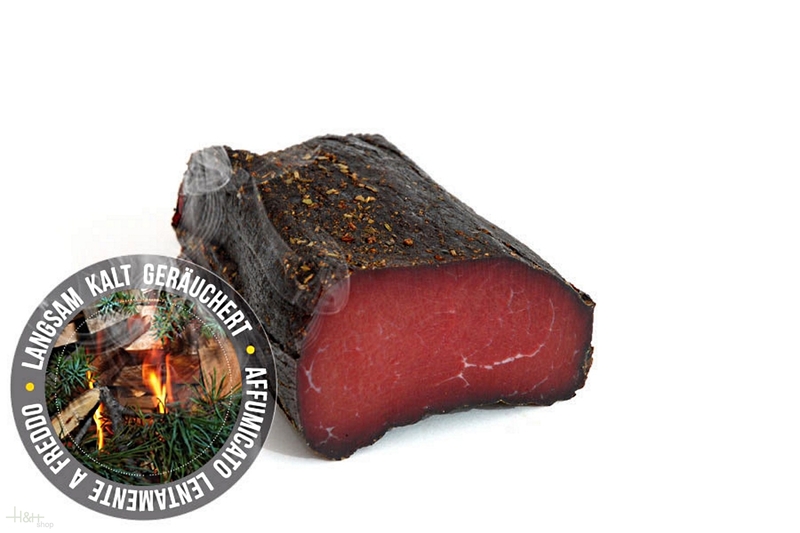 Buy now this product together with Speck Bacon South Tyrol Senfter IGP 1/2 approx. 2,2 kg. ready for shipment: in ca. 5 days Speck Bacon South Tyrol Senfter IGP 1/2 approx. 2,2 kg. Tirol ham Villgrater 1/2 approx. 3,6 kg. 42,90 EUR / 1,19 €/100 gr.